Show and Share is one of our favorite activities during our business meeting. Everyone loves seeing what everyone else is creating! Click on the above title in green to take you to the Show and Share page. There you will find an archive of dates of many quilts to view. 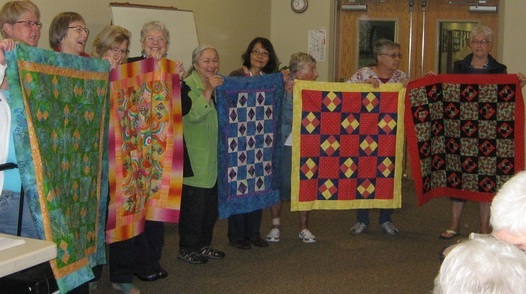 Blocks are made by members and given to members of the guild. You must sign up to participate. Then you must be a member for at least 2 years to be eligible to receive. You must make blocks for other members in those 2 years and express a desire to receive when eligible. Click on the title above to take you to the Friendship Block page. Opportunity blocks is another fun voluntary activity we do in the guild. The chair person picks a block to make every other month that is alternated with the Friendship Blocks. All members are eligible to participate and can make as many of these blocks as they like. Their name goes into a basket for each block that is made and a drawing is held. The winner takes home all the blocks to make whatever they like with them. Click on the title above to take you to the Opportunity Blocks page.